With the Fourth around the corner, you probably know that you’re going to have a cookout or a party, and entertainment is so much better when you’ve got a pergola. There’s a growing demand for the popular pergola that we at MAD Fence have noticed. These are beautiful, aesthetically fitting and decorative structures that can serve a multitude of purposes. A recent trend is growing vines across the top to create a natural shade for your outdoor enjoyment. With the Fourth around the corner, you probably know that you’re going to have a cookout or a party, and entertainment is so much better when you’ve got a pergola. With such short notice, and only a weekend left to work on it, you might want a DIY kit to speed up the process! Why should I install a pergola? They are perfect for that last, missing accent that will complete your landscape. A pergola makes a statement without being too overwhelming. It’s also a low-commitment investment, unlike a gazebo or something similar, which require a lot of building time and permanence. If you’re searching for something easily removable, a pergola is perfect. And, as mentioned, they give a wonderful space for climbing plants. Allow yourself to be surrounded by nature, while being shaded comfortable from the summer sun. What’s so good about your DIY kit? We offer three different styles, all of which come with a lifetime warranty. Our selection is sure to have a style that’s right for you. 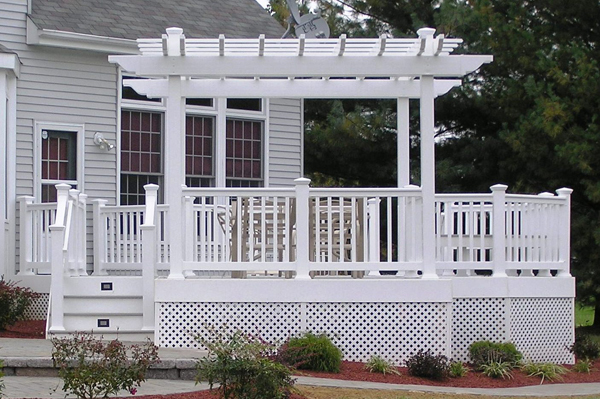 Our vinyl pergolas are guaranteed to resist yellowing, chalking, chipping and other damages. The benefits of DIY are simple–you get to create the pergola, and you get to create it on your own time. A DIY kit means you don’t have to wait for us to come to you. Also, it can be quite the project to tackle for parents and children to work on together! Bond during the building process, and bond while enjoying your new pergola. Do you want to get your own DIY pergola for Independance Day? It’s not too late. You can still get that perfect addition for your yard before summer hits full-force. At Mid-Atlantic Deck & Fence, your DIY pergola will be affordable and beautiful, guaranteed. We have the absolute best vinyl pergolas available. If you want an extra addition to your yard without the extra commitment for this Fourth of July, call MAD Fence for your DIY pergola, now!